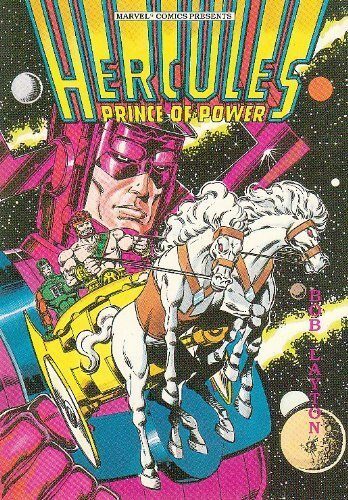 Like Thor: Ragnarok, this classic run injected new life into the character by infusing both a dip into mythology and a dose of science fiction. Also, it’s totally gonzo at points. If you saw the movie with a nerd friend or three, you may have heard an involuntary gasp of appreciation at a certain bust on the Grandmaster’s tower — that would be Beta Ray Bill, a character long awaited by fans and introduced by Simonson. A humble alien, humanoid but clearly not human, Bill proved to be as worthy of Mjolnir as Thor Odinson, and things got wild from there. 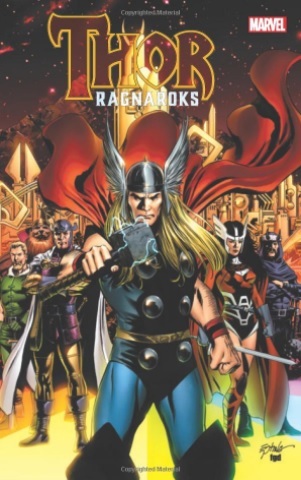 Just released by Marvel, this collection puts more focus on Thor’s supporting cast given pretty short shrift by the movie. 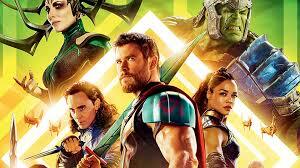 The Warriors Three, Lady Sif, and the completely ignored by all three movies Baldur the Brave play important roles in Thor’s past, before the book moves into a superheroic Ragnarok that hits the beats of the prophecy and focuses on Thor’s family relationships. 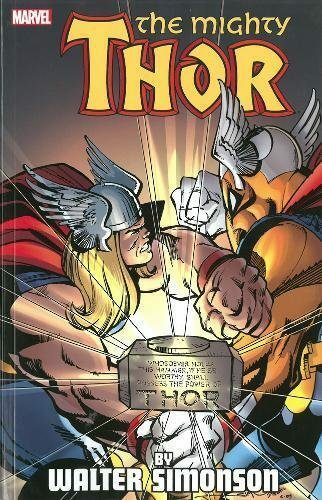 But thanks to Simonson, Marvel can’t have a Ragnarok without Beta Ray Bill, and he gets a spotlight as well in this underappreciated but excellent run. It has been somewhat overshadowed by the relaunch of the title by J. Michael Straczynski and Olivier Coipel, which creates a status quo that the movie can only hint at, and which Avengers: Infinity War is likely to ignore completely. Over the decades, the Hulk has had many personalities. Because of his portrayal on TV and movies, people are surprised to discover how articulate he was in his first comics appearance. Eventually writer Peter David added in that Bruce Banner suffered from multiple personality disorder, which manifested in different Hulks. Two favorites out of that would be Vegas mob enforcer Joe Fix-It and “the Professor.” Though it’s an interesting idea that led to many great Hulk stories, there just isn’t a better one than the one that inspired Thor: Ragnarok. In Planet Hulk, writer Greg Pak ignored the baggage of “which Hulk is this?” and centered on “who is Hulk?” The answer isn’t “the strongest one there is,” though that’s on display here. Instead, betrayed and blasted into space by a group of Earth’s smartest superheroes, Hulk lands on Sakaar and discovers that this savage planet suits him well. Thrown into the arena and forming a bond with his fellow fighters, the Hulk unwillingly develops leadership skills. He finds peace with himself while still maintaining his rage, and the moment that Bruce Banner does return is surprisingly poignant. If comics were allowed to end simply because they’ve found the right note to end on, this would be it. The Hulk’s story could have ended satisfyingly and beautifully with Planet Hulk. It didn’t. 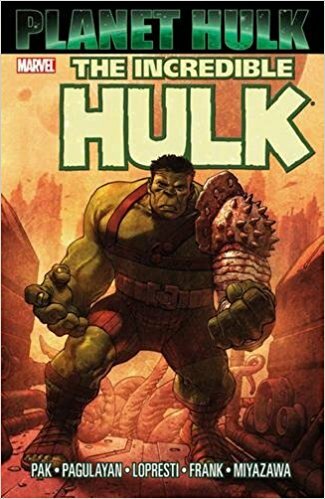 Contest of Champions by Bill Mantlo and John Romita, Jr.
Taika Waititi infused Planet Hulk with a little DNA from this book — considered Marvel’s first official limited series. While not the first appearance of the Grandmaster, it’s a story that focuses on him and establishes his being brother to the Collector. The Grandmaster gathers heroes from around the world and pits them against each other in games as he wagers against Death. In Thor: Ragnarok, the Grandmaster (Jeff Goldblum) refers to the arena as his “Contest of Champions,” and again, Marvel has used the name in several places. But this is also of note for being a series written by Bill Mantlo, the creator of Rocket Raccoon, and honestly, the royalties from its sale do help Mantlo a bit, as he’s no longer physically or mentally capable of writing comics. No, you didn’t miss a character in the movie. But the spirit of this series inhabits Thor: Ragnarok, as the ancient Greek God finds himself wandering space and having cosmic adventures. Proud, self-absorbed, occasionally doltish, but eventually always doing the right thing, Hercules surely lent his personality to the Thor of Taika Waititi’s film. I can’t guarantee Chris Hemsworth read this book, but it sure feels like it. If you want to go really deep, Simonson is creating a new riff on Ragnarok with IDW Publishing, with an undead Thor (which, somewhat ironically, is kind of where Thor was before Simonson took over the Marvel book). Of course, Marvel has done much cool stuff with Thor in this decade, and I encourage you to check it out at your local shop (or Amazon).